Ninety percent of all hydraulic leaks occur in the reel hydraulic circuit, mainly due to the necessity of having flexible hoses extending from the front of the machine for the front reels. These hoses see a lot of flexing during the mowing day as cutting units are raised and lowered. Cutting units also steer and float to follow undulations, increasing fatigue for the reel motor hoses. 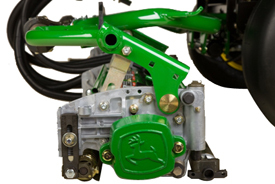 The 2500E E-Cut™ Hybrid Riding Greens Mower has eliminated 102 potential leak points by removing all hydraulics from the cutting unit drive circuit. 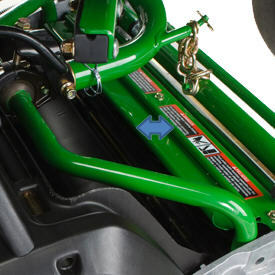 The 2500E E-Cut Hybrid Riding Greens Mower is unique because electrical power is used to minimize hydraulic leak opportunities in the reel circuit, but an engine is utilized to ensure optimal performance throughout the day. This presents an opportunity to further enhance machine performance through reduced sound levels and improved fuel savings by running the machine at less-than-full throttle. Scalping and verticutting operations should always be done with the engine at its fullest throttle level. The 2500E E-Cut Hybrid Riding Greens Mower can be effectively run in mow at an engine rpm reduced to 2250 rpm. At this operating rpm, the operator may experience up to a 6-dB(A) reduction in sound on diesel machines and 4 dB(A) on gas machines, compared to operating at full throttle. Keep in mind that decibel-amp is measured on a logarithmic curve, so even a 1-dB(A) sound reduction is substantial. In addition to the reduced sound levels, you may also experience fuel savings as well. Current studies have shown that, depending on conditions and usage, fuel savings can be as high as 30 percent when running the machine at 2250 rpm as opposed to running at full throttle. To help operators gauge the 2250-rpm level, a throttle notch has been incorporated into the slot for the throttle lever. 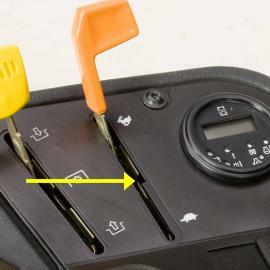 To approximate 2250 rpm, the bottom edge of the throttle lever should line up with the notch in the throttle lever slot. This will not equate to exactly 2250 rpm, but will get operators close to this level, allowing them to effectively reduce sound levels and decrease fuel consumption during operation. The electric reel motors on the 2500E E-Cut™ Hybrid Riding Greens Mowers are brushless, allowing them to be compact in size, roughly equal to that of today's hydraulic reel motors. The brushless motors are very efficient, leading to years of optimal performance with very minimal maintenance, and sealed for protection from the elements. The motors are bidirectional and variable speed, meaning they can spin forward or reverse and at a range of rotational speeds. 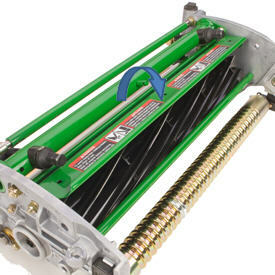 The motors spin forward for mowing and scalping operations and backward for verticutting and backlapping operations. A simple switch on the reel switch box controls the direction of rotation, and a rotary dial on the switch box controls the speed of rotation. A poly chain belt connects the motor shaft to the reel and rotates the reel when the cutting units are engaged. The internal components of the motor are epoxy sealed for long life, durability, and protection from the elements. Cutting units are easily removed from the cutting unit motors by loosening the two bolts securing the motor to the cutting unit, turning the motor approximately one-quarter turn, and pulling the motor from the cutting unit. This can be done in a matter of seconds. A tether prevents damage to the wiring harness when the motor is removed. 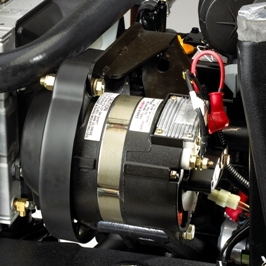 The reel circuit is powered by a 48-V, 100-amp alternator belt-driven by the engine. The alternator supplies constant power to the reel circuit and only generates the 48 V when the mow system is engaged. 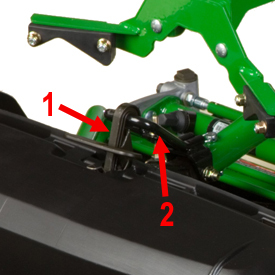 Due to this design, no additional batteries are required to drive the reel motors on the 2500E E-Cut™ Hybrid Riding Greens Mower. With traditional electrical mowing systems, the frequency of clip would change as the batteries drained while mowing. A battery pack begins to lose its power immediately when used. But not on the 2500E. 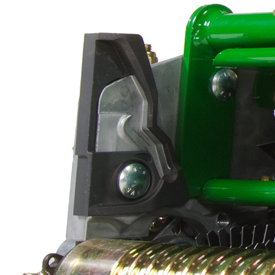 Since the 2500E still uses an engine to drive an alternator, the frequency of clip on the first green and the last green are exactly the same, yielding unparalleled quality of cut from start to finish. Plus, you don't have to plug the machine in to charge the batteries once your day of mowing is done. The only limitation on run time with the 2500E is making sure the operator starts the day with a full fuel tank, just like any other gas- or diesel-powered machine on the market today. 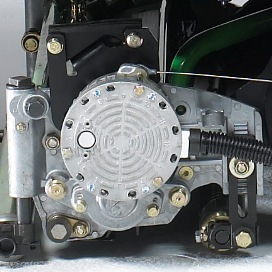 The alternator only supplies power to the reel circuit. 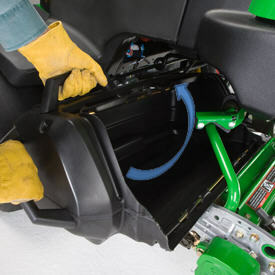 The remainder of the circuits are powered by the same 12-V battery used on the 2500B PrecisionCut™ Riding Greens Mower. These mowers feature a 617 cc 21.0 hp* (15.7 kW) engine that is rated at 3600 rpm engine manufacturer gross power tested in accordance with SAE J1995. It has a single fuel tank with a 7..9-gal. (29.9-L) capacity for a productive day of mowing. * The engine horsepower and torque information are provided by the engine manufacturer to be used for comparison purposes only. Actual operating horsepower and torque will be less. Refer to the engine manufacturer’s website for additional information. 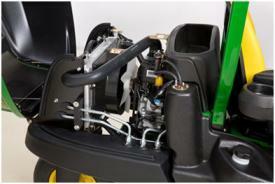 Using the QA5 14-blade cutting unit option on Greens Mowers will lower the FOC and also provide a clean, smooth cut. It can increase the playability of the putting surface and greens speed. FOC is defined as the distance traveled between consecutive cuts. It is how far the machine moves from the time one blade passes across the bedknife until the next blade passes. The lower the FOC, the less distance that is traveled until the next blade passes. There is a point of diminishing returns when it comes to FOC. The less distance the mower travels between consecutive cuts, the more times the same grass blade is going to be impacted by the reel. Too low an FOC can cause bruising of the turf — especially in the overlap from pass to pass. The geometry of John Deere cutting units makes the optimum range for FOC between 0.160 in. (4.064 mm) and 0.190 in. (4.824 mm) for Walk Greens Mowers and 0.044 in. 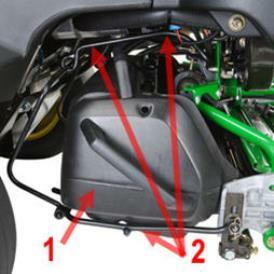 (1.1176 mm) per 1 mph (1.6 km/h) for Riding Greens Mowers. 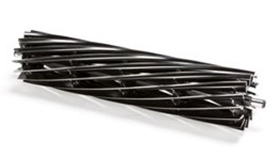 Technology of the QA5 cutting units excel and provide a superior cut and after-cut appearance.